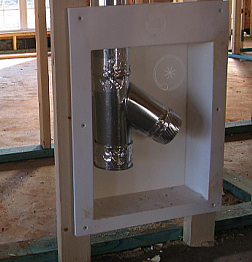 In addition to choosing a good HVAC contractor, you will need to choose how to heat your house. The most common choices are oil or gas furnace, or electric heat pump. The biggest part of the HVAC contractor’s job comes in the days following completion of framing, when the house is dried-in and has a roof. I recommend that the HVAC rough-in follow that of the plumber and precede the electrician. Some of these types of contractors can be particular about the order that they want to work in. Consult with all three of these subs to verify what their preferences are. ● Provide all labor and materials to equip your house with a complete climate control system. ● Make all mechanical calculations to determine how large (tonnage) your system needs to be. ● If you’ll be using gas appliances or a gas fireplace, he will provide all labor and materials to run the gas supply to each. ● Provide all labor and materials to install ventilating systems ─ kitchen and bath exhaust fans and dryer ventilation. ● Do all of this for one contract price. If you want to go for some of the increasingly popular climate control system extras, such as whole-house humidifying and whole-house air filtration, your HVAC contractor can provide these as well.